Although this postcard is titled Church Street, it does take in a fair old bit of Salford too. I would guess that the photographer had his tripod set up close to where the 'Little White Bull' (Pitchers Bar) is today. On the left, at the corner of Railway Rd (Station Rd when this was taken), is the White Bull and on the right is the Bay Horse. Just to the left of the Bay Horse, is the ivy covered house on the corner of Holme Street, mentioned in another post, on the plot that would later be the Woolworth's store. 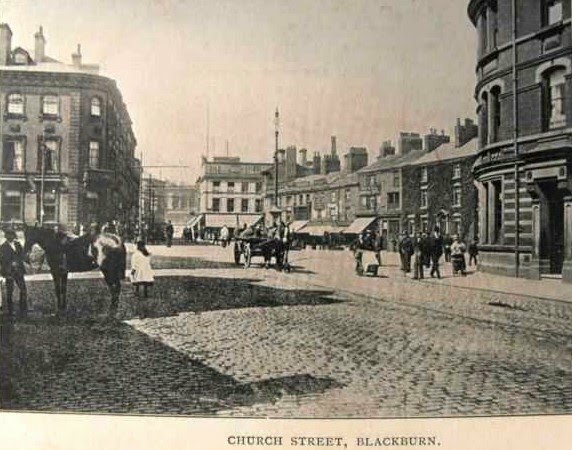 Further left, close to Victoria Street, is the Golden Lion and at the top of this section of Church Street, at the corner of Darwen Street (though not very visible in this photo) is the Old Bull Hotel. I have recently discovered that my g/g/grandpaents (James and Mary Calder) lived in Blackburn. 1841 in Ainsworth St and 1851 in Chapel St. James was born in Scotland in 1798. He was a shoemaker. Thanks Brian. The blog is still under construction really, so I'm surprised you found it, but happy to hear you enjoyed it. Cheers. A quick question, the little White bull, now called bounce nation was a pub I drank in the late 80's. I can't remember it's name at the time, before it was called pitchers bar. Any ideas anyone ? Hi Ian - It went from being Ye Olde White Bull (Little White Bull) to being The Brewers Arms (1979) and then became pitchers Bar in 1998. Brewers, that's it thanks for that.